Coconut Milk & Lime... Natural Hair Relaxer? There is a demand for coconut milk. It has been estimated that 25% of the world’s output of coconuts is consumed as coconut milk. Many traditional people from Southeast Asian countries use the milk to nourish hair from roots to ends. Limes are a big source for vitamin C, calcium, iron, and copper. And some people have reported that combining the two can relax curly hair naturally. Pheliao inquired just that when she came to our Curly Q&A for answers. Coconut milk and Lime juice - deep conditioner or relaxer? I have a mixture of 3a, 3b, and 3c hair. It is a little bit heat damaged and I was looking for a good deep conditioner. On YouTube I saw this video by andreaschoice, who uses coconut milk and lime juice as deep conditioner. I've read many reviews, but most of them were made by people with hair types 4a, b and c. Now, is this treatment going to loosen my curls and frizz them up more, or is it going to work as a deep conditioner? It seems that every few years this homemade coconut milk treatment comes about with a new following and hype. It has not been proven to relax curly, coily, or wavy hair although many suggest it does. However, most agree it is an amazing moisturizing treatment. By definition a hair relaxer is a cream or lotion that is applied to the hair to straighten through chemicals, like the active ingredient sodium hydroxide or calcium hydroxide. It breaks down the hair shaft to alter the hair’s texture by loosening the curl pattern. There are no all-natural hair relaxers on the market to date. What some may experience while using the coconut lime masque are dry strands responding positively to the moisture-plentiful ingredients in most of these treatments. 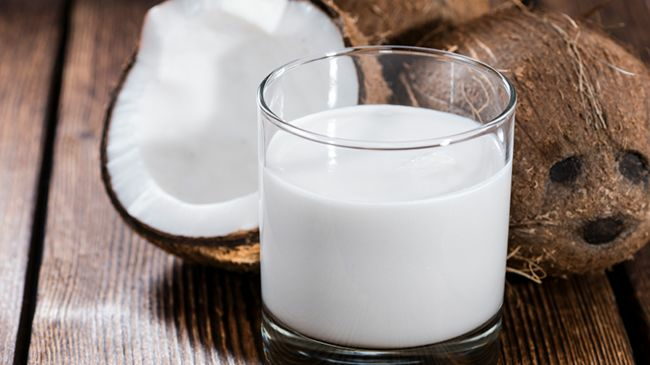 Coconut milk acts as a natural detangler and conditioner and with the amazing minerals like phosphorus, calcium, and potassium it seems like a winner for hair health. Limes are full of vitamin C, which helps is great for fighting dandruff and can help manage an oily scalp. Both of these ingredients will help your hair and may even combat frizz, but it is more of a conditioning treatment than a relaxer just as chemist JC from The Natural Haven suggests. There are several variations of this treatment, so I have a few below. Feel free to give them a try to gain moisture and shine without losing your curls. Combine all ingredients in a bowl and stir until smooth. Divide hair into at least four sections and apply mixture to each section ensuring all strands are covered. Cover with a plastic cap and allow mixture to sit on hair for 45 min. to an hour. Rinse out completely, moisturize, and style as usual. Pour coconut milk into a saucepan and add olive oil and whisk until smooth. Add lime juice and cornstarch and mix while adding medium heat and whisk constantly. Do not cook the mixture but rather allow the heat to activate the cornstarch and to thicken mixture to a conditioner consistency. If mixture is too thin then add more cornstarch. Allow to cool and apply mixture to sectioned hair making sure all hairs are covered. Cover with a plastic cap and sit under a hooded dryer or a heat thermal cap for 30 min. Rinse, cleanse, and style as usual. Any remaining mixture can be placed in the freezer for another application.